Filling: boil the potatoes and mash them when they are done. Add salt,chilli powder and spices( I add coriander powder and Garam Masala). The filling is ready. -Now cut the edges of the breads. Don't throw them. Instead of throwing, you dip the bread edges in some water and make a dough. You can use this dough to smooth the bread roll. -Take the cut piece of a bread, dip it in a bowl of water just for enough time to let it wet. Squeeze the water from the bread by pressing it between your palms. Now put a small ball of potato filling in the middle of the bread and wrap the rest of the bread around the filling. Close any hole with the help of bread dough that you made of the leftover bread edges. 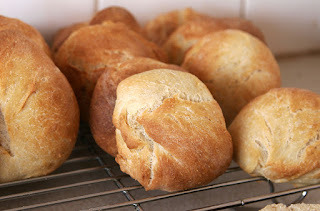 -Heat the oil in a pan and put the bread rolls in it. When you first put the rolls in the pan, the heat should be at the maximum. You can dim the heat after rolling them over to other side.This ensures that the bread rolls don't open up while frying.